THE FUN SOUTH POLE EGGSPEDITION! Our Penguins are ready to play with you. Roll the coloured dice to find the matching hidden eggs. 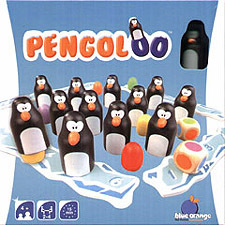 The first player to collect six Penguins with their eggs on his iceberg wins the game. Memory and a bit of luck will help you succeed in this fun South POle eggspedition! In slightly more detail, players roll coloured dice, then look for eggs of those colours. The twist is that you can re-find eggs that have already been found to take additional turns. The advanced rule option allows players to steal eggs from each other.